So much incredible action happens within the 340 acres that make up the main Yale campus. Yesterday, for example, I spent time debating the nature of nationalism and democratic peace up Hillhouse Avenue with my Approaches to International Security seminar, got lunch with a couple of friends at the other end of campus speculating on Halloween festivities, worked on a social entrepreneurship curriculum for high school students with an MBA student on the top floor of the my favorite building on campus, Kroon Hall, and attended a tea that welcomed back the former residents of my residential college suite, Bookworld. I’ve always wondered what it would be like to map out the paths that students travel spatially at Yale on a daily basis. How do we interact with each other, faculty, extracurriculars, resources, and so many other wonderful things on campus? Since I stepped foot on campus freshman year, many parts of the campus has opened up section by section, whether through explorations with friends through different buildings and houses or through more intangible paths. One project in particular has brought many separate parts of campus together for me and allowed me to explore areas that I have never even heard of. Fellow blogger Abdul and I are both Mellon Mays/Bouchet Fellows! Abdul wrote an awesome blog about his fellowship experience this summer. Beyond funding and resources, the wonderful community built around this fellowship supports our independent research efforts and our pursuit of graduate studies. So for this blog, I thought it would be cool to show you a few places around Yale and beyond that this fellowship and my independent research has taken me to. My research sits at the intersection of economics, climate change, and international development. A personal connection with the environment and movement has kept the notion of climate migration, initially in association with Kiribati and other atoll nations in the South Pacific, in my head over the years. This fellowship finally gives me the go ahead to delve into the millions of questions and conduct my own research. After talking to a number of development economics professors in the Economics department about how to conceptualize climate related migration, I shifted my focus to the School of Forestry. I’ve been following the work of an incredibly interesting lab there, and the project gave me an excuse to learn in more details what they are all about. Professor Seto and her team use satellite imaging to predict and explain trends in urbanization all around the world. In doing so, their research helps guide policies in land use, urban development, and migration. 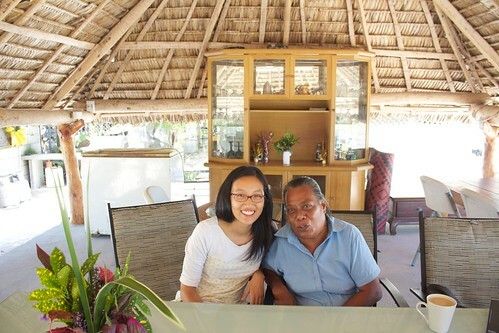 So in May, I found myself sitting with the coordinator of the Seto Lab up near the Yale Farm asking about how to use GIS and other spatial imaging tools to answer questions about urbanization and migration around Tarawa, the main island of Kiribati. 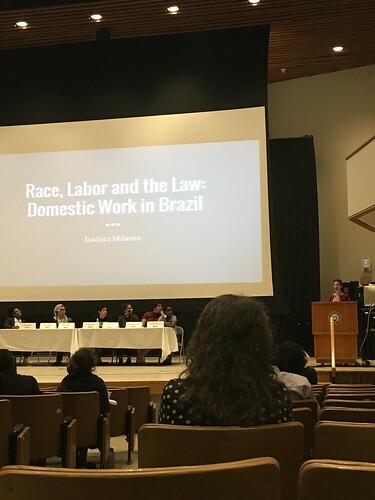 Over the summer, a few of the other Mellon Mays/Bouchet Fellows stayed in New Haven to do preliminary research. We spent lots of time together outside of work, enjoying the summer in the Elm City. One evening was particularly memorable. 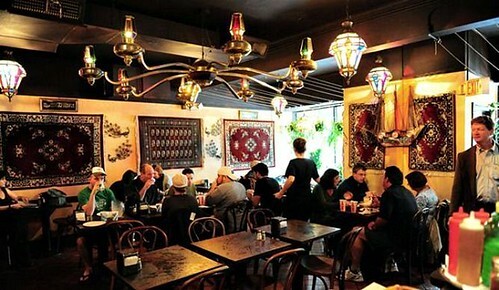 Mamoun’s is a lovely Middle Eastern hole-in-the-wall restaurant a block away from campus. Sitting outside, we spent the evening chowing through our falafel sandwiches, sharing interesting findings on one friend’s literature review on domestic work in Brazil and another friend’s results from her psychology experiments. My next stop took me a little ways away from Yale to the middle of the Pacific Ocean. I had landed in Tarawa, Kiribati, and just days ago I had been talking to policymakers from across the Pacific at the Asian Development Bank’s Pacific Update Conference in Fiji. Over the next weeks, I stayed with a host family on Tarawa and interviewed everyone from the National Climate Change Coordinator to fisherman selling their catch on the side of the road. Back on campus, our Mellon Mays/Bouchet cohort headed out to Wellesley College late in September to attend a regional conference for a weekend of sharing and learning. Some of us got a chance to present our research to our peers from schools all over the East Coast. I did, in such a formal setting, for the first time! It was a fantastic learning experience. Not the last stop for sure, but since the semester started, I’ve been taking my research to different places on campus. I’ve met with my research mentors and more informally with graduate students to learn about their lives. I’ve attended a few talks, spoke with different folks over the phone, and delved back into thinking deeply about my topic. All the while, there is always the Mellon Mays/Bouchet Fellowship Director to support my journey. So most recently, we sat down in her office and reflected on the whole process thus far. After all that I’ve explored and experienced, it’s always great to have a home base to return to.